Is life comfortable with everything running smoothly? Then this is a time to fall humbly before God in thanksgiving and exercise faith to resist fleshly impulses. Don’t make the mistake of thinking “the good life” is where it’s at. But God said to him, ‘You fool! I will demand your life from you tonight! Now who will get what you’ve accumulated?’ That’s how it is when a person has material riches but is not rich in his relationship with God” (Luke 12:16b-21 God’s Word©). The problem in this parable is not “material riches”. Jesus warns against resting in pleasures, greed serving only self, and plans rooted in this temporary world without regard for Creator. Instead, choose the opposite kind of “riches” from a personal “partnership with God”. The presence of Paraclete is real when life is good and when it’s not. A relationship with Jesus surpasses all theological theories, and exceeds “material riches” because “You have here no lasting home. You are a stranger and a pilgrim wherever you may be, and you shall have no rest until you are wholly united with Christ. Why do you look about here when this is not the place of your repose? Dwell rather upon heaven and give but a passing glance to all earthly things. They all pass away, and you together with them. Take care, then, that you do not cling to them lest you be entrapped and perish. Fix your mind on the Most High, and pray unceasingly to Christ” (Thomas à Kempis, “The Imitation of Christ”, Book Two, Chapter One). So true. Having riches isn’t the problem; it is Trusting in them, as you say. Love this! Your statement: “Jesus warns against resting in pleasures…” hits the core of the problem in this parable and in today’s mindset. 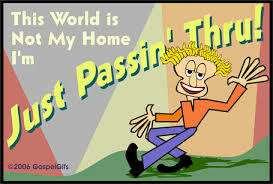 Far too many trust in this world’s riches and not realize, as the picture suggests, that we’re “just passin’ through”. True riches is found in having a real relationship with the One from Whom all Blessings flow. Thank you for this! Blessings!